Scorpion. Whip Scorpion. Tailless Whip Scorpion. Also known as Whip Spider. That's right folks, when it comes to arachnids the imagination involved in their common names is approximately nil. It's no wonder that these other arachnids are so little known despite looking so distinctive and alarmingly creepy. It's all just "spider thing" and "scorpion thing". Anyway, Tailless Whip Scorpions are indeed a whole 'nother group of arachnids. 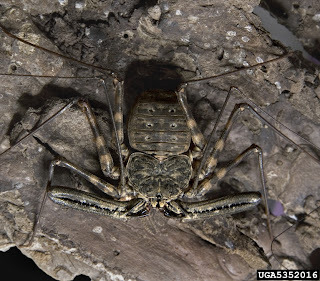 They are in the order Amblypygi, which means "blunt rump". Because they're tailless. They're also nightmares made into flesh and exoskeleton, but few seem to have noticed that. The other end is of more concern, anyway. Their pedipalps have become huge, grasping, grappling, raptorial implements, lined with hungry spikes. They look a lot like arms with a shoulder, elbow and extra long barbs where the fingers should be. In fact, when they're bent at the elbows it actually looks like they're stuffing food into their mouth. Maybe they're just directly consuming pure, intangible Life? Probably. 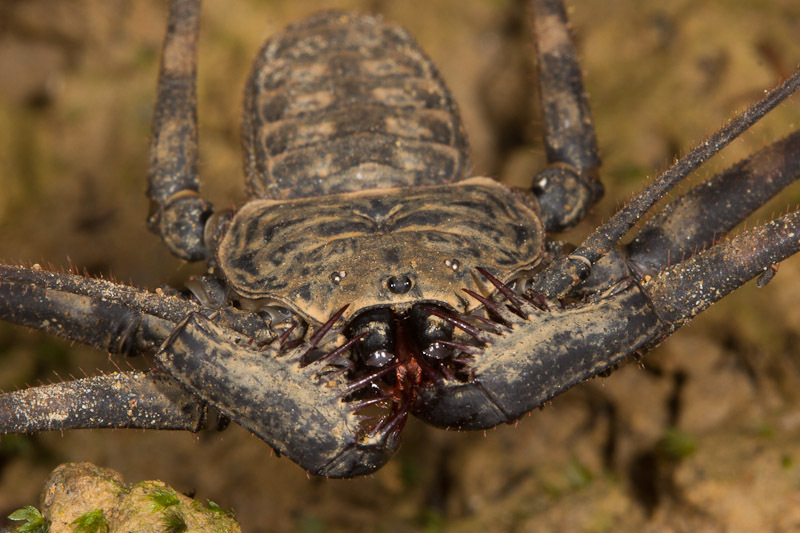 For some Tailless Whip Scorpions these fearsome weapons can be longer than the rest of the body. Others are much more modest in length, but they remain extravagantly threatening. It's a good thing they don't get particularly big - between just 0.4 and 4.5 centimetres (0.16 - 1.8 in). Phew! Good news for us. Their insect prey probably don't care about our relief, though. 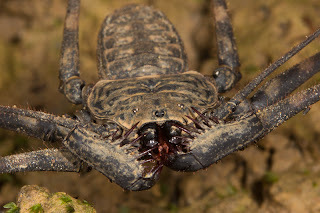 Tailless Whip Scorpions are completely lacking in either venom or silk, so they shall just have to rely on those massive grapplers and spikes. A strategy of grab and stab, before mashing them up with their mouthparts. But how do they find their prey in the first place? This is where the "Whip" comes in. For the Whip Scorpion it was a long, sensitive tail. This is clearly not an option for something that earned the name Tailless Whip Scorpion. They instead use their first pair of legs, which are absurdly long and incredibly flexible. Each one can have over 100 joints, so they can really sense their full surroundings and even around corners! 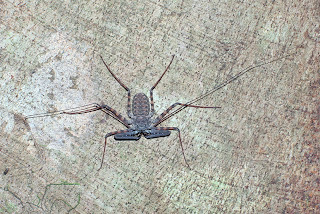 Tailless Whip Scorpions often also walk sideways, using one whip to scout ahead while the other investigates the sides. This walking is of course done with the remaining 6 legs. For most, this activity is done under cover of darkness. 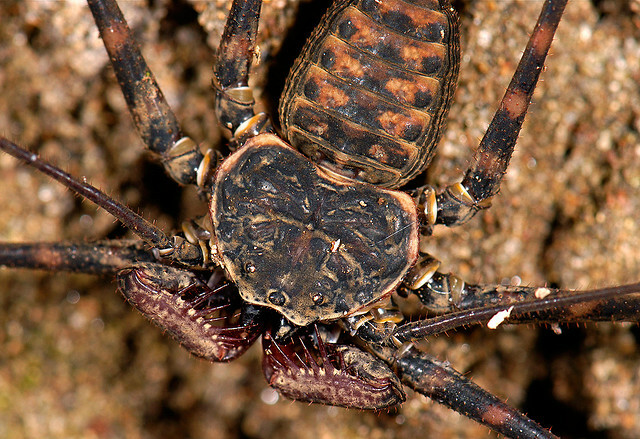 Tailless Whip Scorpions are remarkably flat, all the better to hide in damp crevices by day. As is usual for arachnids, Tailless Whip Scorpions mate by the male dropping a spermatophore for the female to pick up. She then lays her eggs and carries them around under her abdomen for several months. Once they hatch, the youngsters clamber onto her back and she continues to carry them about. Of course, they keep themselves further and further apart as they grow, and once sexually mature they really don't want anything to do with the family. Interestingly, even rival adult males seldom come to blows; they usually sort out their differences with a circling dance and vibrating their whips in each others increasingly infuriated face. Eventually, someone backs down without getting slashed, impaled or anything. Clearly, just because you look like all the worst parts of a barbarous, alien, beast cross-bred with all the worst parts of another barbarous, alien, beast, it's no excuse for ungentlemanly behaviour. It also seems we have a lot to learn about just how much use we could be getting out of our humble, household whips. Ant names are even less creative. I mean, seriously? "Little Black Ants?" That's the real name, it's not just someone with no entomological knowledge trying to describe a problem? As a side note, I've also seen these guys called "cave spiders," and I saw someone eat a couple of live ones on that show "Fear Factor." Apparently you have to eat them backwards or they'll grab on to your tongue with those cute little pedipalps of theirs. Not entirely sure how eating them backwards prevents that. I think maybe it would just be best not to eat live whip spiders. Ha! I see what you mean, but at least there are loads and loads of ants. So "Little Black Ants" is unsatisfactory and lots of ants are little and black, but millions and millions aren't. The problem with arachnids is we got spiders and then we got a whole other family of arachnids which gets called an "adjective spider". Imagine if wasps were Winged Ants and bees were Fuzzy Winged Ants! I think it's best not to eat them, too. There isn't much I'd eat from a cave. I don't really eat anything live, either. Cooking is right up there with art and language, why waste it? At least we don't call an octopus a, "Soft-Shelled Suction-Legged Sea Spider." ...Actually, I think I might start doing that. Hahaha! At least people will know what to say when there's more than one of them! 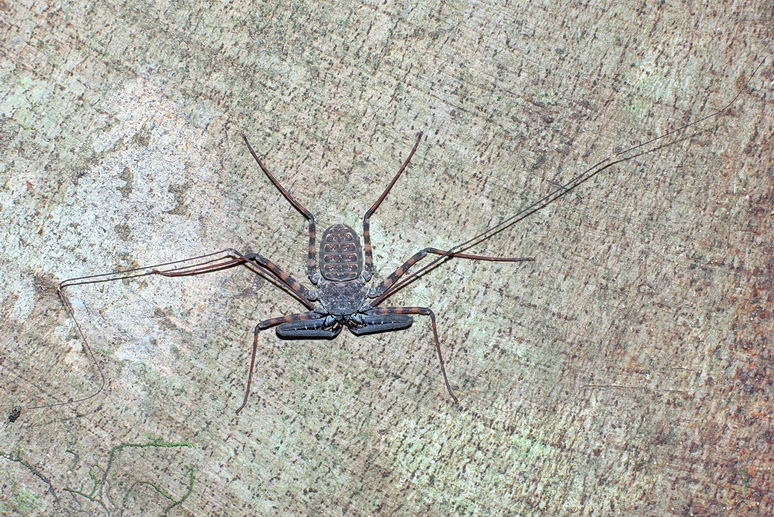 I would like to get rid of a tailless whip scorpion....ok, I live in the tropics and am moving to a new apartment. Unfortunately, there is a tailless whip scorpion in the room that I am rennovating into my kitchen and livingroom. I don't see him there during the day but he is in the exact same spot on the wall every night that I've stopped by. 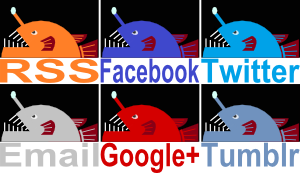 He is very scary looking and much bigger than your post says. He's about 3 inches with his legs bent up. Havn't seen any others around. I want to get rid of it. Any suggestions. If I spray him he'll run. any suggestions. Is he hard bodied or not? I swatted him with a big shoe would it be effective or not. You could easily just put her in a glass and throw her outside. They're not venomous so the most they can do is a little nip if that. They look a lot meaner and more dangerous than they actually are! Install all of the electrical connectors. You can check to make sure the lights work and look as expected here. do glue traps work?